For consumers, cheap is preferred to expensive, more is preferred to less, it's a no brainer. For many Filipinos, they want cheap rice. And cheap rice is readily available from our neighbors Vietnam and Thailand, and soon, Cambodia, Laos, possibly Myanmar. Nature, not politics and governments, determines who has better resources for growing rice. 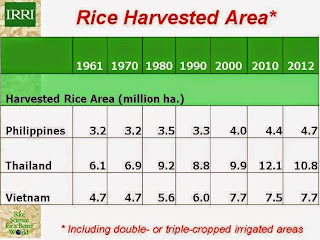 (1) Rice land area, Thailand for instance has almost 3x that of PH's. (2) Exposure to strong typhoons, TH and VN get perhaps only 5 storms a year vs. PH's 20, of which half make actual landfalls and cause direct damages; (3) Irrigation, they have the huge Mekong River, Ton le sap river, others as they are in one big landmass, vs PH's archipelago. If politics and populism is set aside, we should be better off, a lot better off, if we have free trade in rice. The National Food Authority (NFA) should get out of its marketing function. Doing regulatory function should already keep their hands full of work. From right: Renan, Sec. Kiko Pangilinan, new BOC Commissioner Bert Lina, don't know the 4th guy. Posting this photo without Renan's permission but I think he won't mind, he believes in transparency and freedom of information by the public. I commented at Renan's wall that the NFA and Sec, Kiko's offices should focus their energy to liberalize rice trading as rice prices in Thailand and Vietnam can be up to 1/2 of PH prices. They should institutionalize free trade of rice and not glorify expensive rice. Am sure the BOC and NFA will protest the title of this paper, which is understandable. But I think they should also recognize that rice smuggling happens because there is huge demand for cheap rice. 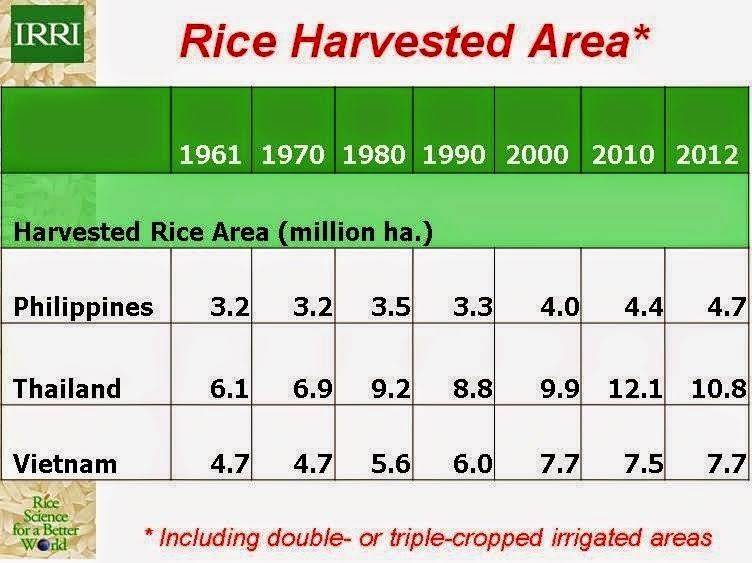 The current implicit policy of the PH government is to make cheap rice from our neighbors become expensive via rice protectionism: rice import quota, rice tariff of up to 50 percent I think, bureaucracies to get import license, etc. Then government turns around and subsidize expensive rice to make it "cheaper" and announce it to the public. I am not defending smuggling of rice or other imported commodities. But I am not defending or supporting the government too in its rice protectionism policy. IRRI's Dr. Bruce Tolentino, other Filipino economists from PIDS, UPSE, etc. have shown the numbers that protected, expensive rice is wrong and anti-poor. Rice protectionism is a 1960s or earlier medieval policy that is continued and defended by the government and some NGOs until today. Why persist on that wrong policy? Why are rice consumers disempowered to choose and buy cheap rice? Another thing, that huge NFA debt, about P155 billion as of March 2014 I think. The DOF, DBM and NEDA have already shown that such NFA debt is unsustainable, walang pera ang NFA to pay those debts, all it does is ask money from Congress every year while further building up the debt. 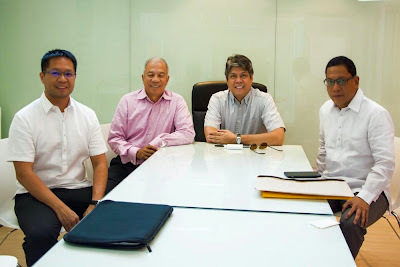 Soon, that huge NFA debt will be passed on to the DOF, and DOF will ask for more taxes as the debt stock has increased by a huge amount, need more taxes to pay for principal + interest, annually. NFA should get out of endless loss-making and passing that debt to all taxpayers someday. It is a lousy arrangement. NFA should stop subsidizing rice to make it "cheap" because cheap rice from our neighbors are readily available. Administrator Renan, Sec. Kiko, other government agri officials, ibaba nyo na ang presyo ng bigas. Remove politics from rice trade. People will remember you. thank you.